Vishen Lakhiani is one of the most influential personalities in personal growth today. A computer engineer and entrepreneur in education technology, he is the founder and CEO of Mindvalley, a 200-person strong company that specializes in learning experience design, creating digital platforms and apps that power online academies in personal growth, mindfulness, wellbeing, productivity, and more. He is also a member of the Transformational Leadership Council and sits on the Innovation Board for XPRIZE Foundation. An internationally recognized speaker on personal growth and transformation, Vishen’s mission is to revolutionize the global education system by bringing new models of enhancing human potential to people everywhere and building a school for Humanity 2.0. This guidebook promises to "hack" conventional thinking by exposing readers to the faulty logic of "brules" (bullsh*t rules) in what Lakhiani calls the culturescape—the mental world of relative truths and ideas that people "should" believe. Lakhiani, founder of Mindvalley, a learning experience company, uses personal anecdotes and those of his successful, famous friends (including Arianna Huffington, Elon Musk, and Ken Wilber) to illustrate how liberating oneself from brules and creating new models of reality can lead to an extraordinary mind, greater happiness, and purpose. Lakhiani's "transcendent practices" include gratitude, forgiveness, self-love, positive visualization, and the ability to see failure and difficult times as opportunities for growth. On occasion, anecdotes seem far removed from the average reader. Lakhiani made a promise to himself that if he "ever woke up two weeks in a row dreading going to work, [he] should quit and think of another job"—an optimistic code for living, but not one that everyone can live by. Still, the author's three most important questions—"What experiences do you want to have in this lifetime? How do you want to grow? How do you want to contribute? "—can be of benefit to anyone. “This book will positively affect the life of anyone who takes the time to read it and implement some or all of the activities into their daily life. 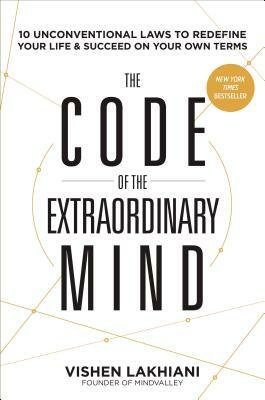 I would love to see The Code of the Extraordinary Mind be required reading for high school seniors and first year college/university students.